Sofas, armchairs and chairs, upholstered in fabric – elements of interior decoration, which are constantly in demand. Upholstered furniture reflects the latest trends, and sometimes dictates them with its original shapes and bold colors. How to care for upholstery furniture for maximum durability of its color and texture? Thanks to the regular cleaning of fabric upholstery with the help of special tools, we improve the resistance of furniture to impurities. Foams or powders intended for cleaning upholstered furniture are applied to the upholstery and left for a time indicated on the package (from several minutes to several hours). Then, with the help of a sponge, brush or vacuum cleaner, rinse the product thoroughly. Unfortunately, some types of tissues require more time to restore their original appearance. 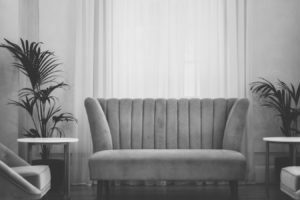 If your furniture is fuzzy, that is, it is studded with velvet or velvet, you can clean it with ammonium solution (1 tablespoon per half liter of cold water). Remember that the plush is not cleaned against the nap – only in the direction. After applying the product, you should comb the fabric with a soft brush and, if necessary, dry it with a hairdryer (in a cool mode). Before you start cleaning, test the product on an inconspicuous area of ​​the upholstery – whether it is safe for the material. The most difficult to keep clean furniture, upholstered in light, monophonic fabrics without patterns – they are visible any, even minor pollution. 1. Do not use large amounts of water during cleaning. Too much wetted upholstery will dry for a long time, as a result of which mold may appear in its deeper layers. 2. Do not use strong remedies, such as stain removers for clothes, bleaches or solvents, because you risk replacing one stain with another, from which you can not get rid of. 3. Stains from red wine, coffee or ink can be eliminated with a solution of citric acid. 4. Tissue upholstery, covered with a ballpoint pen, can be cleaned with glycerine. 5. The stains resulting from the contact of the tissue with food are cleaned with a cloth or a sponge soaked in a solution of a delicate detergent.